This is where I’ll be on Monday, and I’m very excited about it. 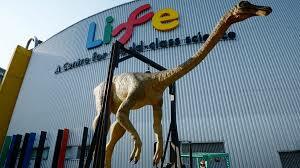 (Not sure if the strangely thin dinosaur will be there though). It’s the Centre for Life in Newcastle, and I’m going to be there helping with DNA workshops and attending the prizegiving for the Royal Society Young People’s Book Prize, for which What Makes You You? is shortlisted. I’m looking forward to meeting some of the very many school pupils who have been involved in voting for the winner, reviewing the books, making films of their judging, and who knows what else. And I love the way they’ve turned the F of life into a chromosome…. Good Luck on Monday, Gill. Diane and I will keep everything crossed for you. The Authors’ Team really missed you at the Kids’ Lit Quiz here in Newcastle on Wednesday. Even with the help of Steve from Seven Stories they were pipped at the post by half a mark by the Librarians. Maybe next year?